The home of Hungary’s parliament is one of Budapest’s most iconic buildings. With a tower as tall as a cathedral’s, it’s hard to miss wherever you go in the city. 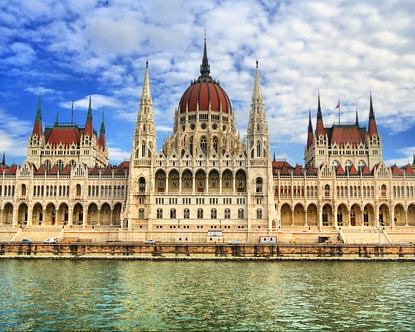 The Hungarian Parliament building is a product of Budapest’s industrial heyday. In the late 19th century, the city was booming, with landmarks such as Andrássy Road, Heroes’ Square, the early Danube bridges and underground metro all being built. The Parliament building was intended as a symbol of the nation, and no expenses were spared for its majestic, neo-Gothic walls. Today it doubles as a working building and a home for Hungarian history. As you’d expect, the Hungarian parliamentary assembly still sits here, as does the Prime Minister. But you’ll also find the crown jewels from Hungary’s regal days. After the Second World War, the jewels were taken into the United States for safekeeping, but they’re now on display at home. You can see the jewels as part of the regular tours here. Once you’ve admired the ornate insides of the building, be sure to find one of the prime viewing spots nearby. These include the Danube river boats, and Batthyány Square on the opposite bank.